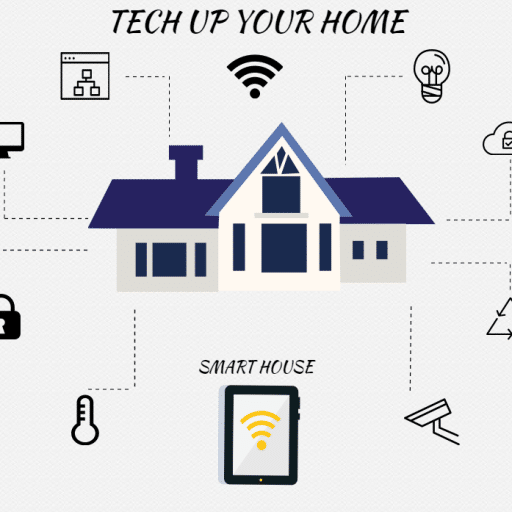 If home automation, home gadgets and smart home are new and unknown topics for you, you may want to check our Automated House – Basic Buyer’s Guide first. We have been testing all the different home automation products to get a perfect mix that you must have in your smart home 2016. Home Automation is new and uncharted territory with a lot of protocols and even more manufacturers that are trying to enter this expanding market, so it’s not easy to find the best products. Home automation gadgets are having explosive growth in the consumer ‘Internet Of Things’ Market. According to Wired, the Internet of Things is far bigger than anyone realizes. The Internet of Things and Home Automation is the future like the smartphones were 6-7 years ago. You can avoid them for a while but sooner or later technology will catch up with you. Unless you don’t fall in the category of people that are scared of new technology, our list of best gadgets to automate your home is perfect for you. This graph from Business Insider show the projected growth of home automation including Smart Home 2016 Energy, Smart Home Security, Smart Appliances and other Global Connected Home Devices. To make this list more accessible we will separate devices by rooms in the house. Nest Cam is one of the best and easy to use home Wi-Fi security camera. With its PC, android and IOS support, excellent applications and even better 1080p resolution and night vision it makes a perfect choice for any house. It features instant cloud saving of footage with alerts on your mobile phone so you don’t have to worry about your home security. Maybe the best thing is that you can have multiple Nest Cam security cameras working together on the same application, and have you home completely protected while you are on your vacation or out of house. Automatic Labs’ Automatic “smart driving assistant” is extremely simple to set up and use, even for the car-clueless. The app logs fuel efficiency, trip costs, and driving habits for later browsing. Audible alerts coach without distracting the driver. Parking places are automatically GPS-tagged. Mail difference from other OBD readers for cars is its simplicity and ease of use. Automatic Labs’ Automatic fits most cars build after 1996 so won’t have problems with compatibility. It has IOS and Android application that work really well so compatibility is not an issue. If you are interested in this product you can Buy it here or you can visit Automatic Labs web page for more information. Automated garage openers are not a new thing like many tech here. But think of this like a step up. Main difference is naturally connectivity. Owners of Amazon Echo will be happy because this automated garage opener works perfectly together. Garageio Smart Garage Controller also supports ITFFF the app that builds triggers between normally unconnected apps and devices. By now everyone who is remotely interested in home automation or home gadgets has heard of Amazon Echo. So what is it? Simple answer is a hands-free speaker you control with your voice. Echo connects to the Alexa Voice Service to play music, provide information, news, sports scores, weather, and more—instantly. All you have to do is ask. Echo works with devices such as lights, switches, thermostats, and more from WeMo, Philips Hue, SmartThings, Insteon, Nest, ecobee, and Wink. And this second is interesting for Home Automation for connecting your devices to Amazon Echo. Philips Hue is maybe the most famous smart light. This house gadget will show you how something that we see as simple as light, can have so many options. You probably think you don’t need it, but when you get used to it you will not be able to live without. My recommendation is definitely starter kit because you will get a hub that is compatible with third party softwares like Amazon Echo. Schlage Connect Century Touchscreen Deadbolt uses Z-wave technology connects to your home automation system and lets you lock or unlock your door remotely via the web or smartphone. Schlage Connect is BHMA/ANSI Grade 1 certified, the highest residential rating. Built from high-quality materials, this keyless deadbolt gives you the highest level of security at the main point of entry. It has build in alarm and fingerprint-resistant touchscreen. Fans are back, and they are back in stile. This beautiful fan have won more than 60 international design and technology awards, including recognition from ENERGY STAR, Popular Science, Interior Design, CES and A’Design. Haiku Home L Series Ceiling has Fan Wi-Fi connectivity, compatibility with Amazon Echo and quality application for control. Did you ever try to make something on the pan but you didn’t know how long or what heat to use for something. That is basically what this Pantelligent pan does and more. The Pantelligent’s easy-to-use app talks you through each step of a recipe and will advise, which makes it easy to learn how to cook new dishes or perfect classic recipes. The hardware that makes the Pantelligent smart is hidden inside the pan. A sensor embedded in the bottom of the pan measures the surface temperature of food. The pan then uses a Bluetooth connection in the handle to deliver data to the Pantelligent app. This easy to use, connected plug allows you to control, monitor and schedule electronic appliances throughout your home using your iDevices Connected app and Siri voice commands. For iPhone, iPad and iPod touch only. You can access anywhere control and monitor the iDevices Switch from wherever you are using your iPhone. This refrigerator is something new. Samsung rolled out family fridge that has a huge touch screen that can do so much. From ordering your food to tracking expiry date. There are 3 cameras that see what food you have, modern way to leave notes to you family and of course its connected via Samsung app to you mobile phone. If you want to learn more about this fridge of the future you can go to visit samsung webpage. Flex-Duo ™ with Dual Door gives you ultimate cooking flexibility, with two independent temperature controls and convection systems, and a removable Smart Divider, so you can cook multiple dishes simultaneously with little to no mixing of odors or flavors. Remotely monitor your cooktop and control your oven with Wi-Fi capability. Use your smart phone to remotely monitor for safety, turn the oven on or off, and adjust the time and temperature on your oven for ultimate cooking experience. If you want to learn more about this oven of the future you can go to visit samsung webpage. iDevice’ Kitchen Thermometer is a two-probe digital meat thermometer. Where traditional models chime, requiring you to be within earshot, this Bluetooth-enabled version sends push notifications to your phone regarding your food’s doneness. The Anova Precision Cooker is the perfect device for the home chef. It’s easy-to-use, lightweight, and connects to your smartphone, allowing you to cook the perfect meal with the touch of a button. Remote Control – Connect Anova to your phone to cook remotely. Cooking Notifications – Receive push notifications on your smartphone when the device is preheating, brought up to temperature and when time is finished. Nest Learning Theromostat is not a new technlogy. It is in it’s 3rd genration and this devices keeps impressing us. Auto-Schedule. No more programming. The Nest Thermostat learns from you and programs itself. Auto-Away. Don’t heat or cool an empty home. Auto-Away adjusts the temperature after you leave. This 2nd generation Nest Protect smoke & carbon monoxide alarm can save you valuable seconds when you are dealing with fire. Connect Nest Protect to Wi-Fi and it will send an alert to your phone if the alarm goes off or the batteries run low. Tells you what and where. It speaks up to tell you if there’s smoke or CO and where the problem is, so you know what to do. Even though some of this devices can’t communicate and be a controlled with the same application, that is the way we are heading. As cool as this home technology is, we still need to pass couple of generation of this tech to get to perfect usability like we have with our smartphones. Lucky for us, technology is evolving last 10 years like nothing else in human history, so we could have some perfect integration of all home automation products like Smart Home 2016 Energy, Smart Home Security, Smart Appliances and other Global Connected Home Devices in a year of two. ← Google Home Is Finally Official! Sony PlayStation 4K – Is PS4 4k ready?